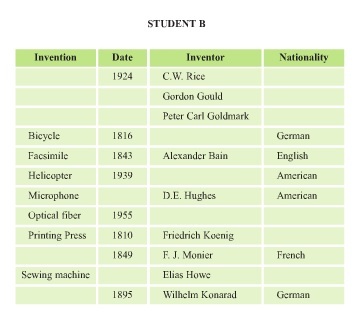 A: When was the bicycle invented? B: It was invented in 1816. A: Who was it invented by? A: What was his nationality? A: When was the color television invented? B: It was invented in 1950. B: By Peter Carl Goldmark. A: What was his nationally? The facsimile was invented by Alexander Bain in 1843. The bicycle was invented by Ferderick Koenig in 1816. The color television was invented by Peter Carl Goldmark in 1950. The helicopter was invented by Igor Sikorsky in 1939. The laser was invented by Gordon Gould in 1958. 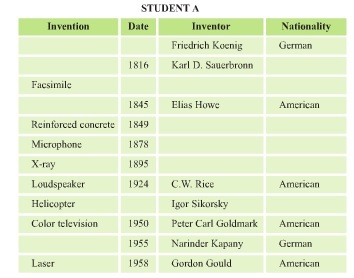 The loudspeaker was invented by C. W. Rice in 1924. The microphone was invented by D. E. Hughes in 1878. The optical fibre was invented by Karl D. Sauerbronn in 1955. The printing press was invented by Narinder Kapany in 1810. 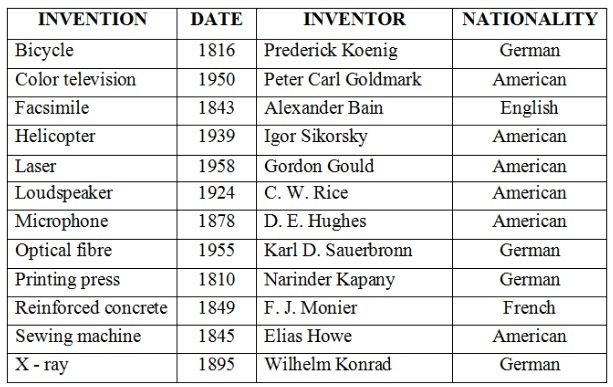 The reinforced concrete was invented by F. J. Monier in 1849. The sewing machine was invented by Elias Howe in 1845. The X-ray was invented by Wilhelm Konrad in 1895.